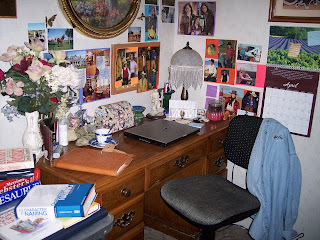 When I first began writing, I had an office in our kitchen, which consisted of a desktop computer with a shelf of trade books overhead. Now that I have a laptop, I moved my office to a corner of our bedroom, where I can shut out "life" when needed. As you can see from this photo, I have lots of pictures--of my characters, where they live, their animals, etc. Besides the normal tools that every writer has, I surround myself with motivators such as candles, lotion, herbal tea, movie soundtracks, even a favorite chambray shirt I deem my official writing shirt. This past Christmas my family gave me a Precious Moments figurine of a girl hiking up a hill. On the bottom it reads "A Journey of Hope." I thought it fitting for this writing journey I'm on and decided to add that to my setting.